Across the courtyard, to the left of the Dining Hall, is an inscribed bell, held from above by two dragons. Together with the drum, on the other side of the dining hall, and accompanied by chanting, it is played every morning and evening to open and close the Temple. 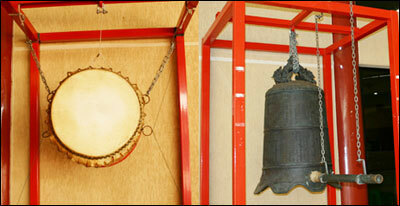 The bell is inscribed with two central Buddhist scriptures: The Diamond Sutra and the Great Compassion Mantra. The former is a profound Buddhist teaching that instructs aspirants to Buddhahood on how they should conduct themselves and on the correct perception of reality. The latter is a prayer of adoration to Kuan-yin, the Bodhisattva of compassion. This mantra brings comfort and relief to beings in all realms. The sound of the bell is said to reverberate in the ten directions, through all the realms of existence. After the bell and chanting comes the drumming. As he beats the drum, the drummer visualizes a thunderstorm bringing life sustaining rain. He calls on Medicine Buddha to protect all beings in the Temple as well as outside seeking refuge and solace within its walls.